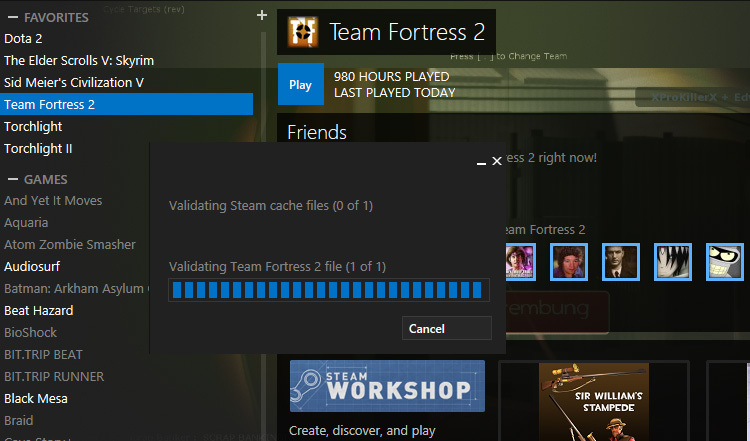 Yes, that annoying Validating Steam cache files message pop-ups up each time you launch Team Fortress 2 or Counter Strike Source from a cold boot (meaning you haven’t launched the game since your PC started up). Here’s a quick rundown of purported fixes for this recurring TF2 cache problem that MAY work for you. Launch Steam and check your game library to make sure TF2 is not present. Team Fortress 2 should appear in a grey font. PPut the gcf files back in their original directory. If it still doesn’t work or if you’ve found a solution that isn’t posted here, drop a comment and we’ll put it up for everyone to see.